— Fox News contributor and former NPR analyst Juan Williams to Newt Gingrich during the January 16 presidential debate. — Politico’s Roger Simon on Hardball, January 17. — MSNBC host Chris Matthews wrapping up Hardball, January 17. — Co-host Ann Curry to Gingrich on NBC’s Today, January 19. 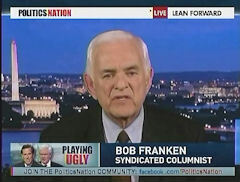 — Former CNN correspondent Bob Franken talking about the GOP candidates on MSNBC’s PoliticsNation, January 6. — New York Times editorial page editor Andrew Rosenthal in a January 6 posting to his “Loyal Opposition” blog at NYTimes.com, referring to an earlier post that slammed the “racist undertone” of various Republican criticisms of President Obama. — NBC’s Rock Center, January 9, talking about the fact that an ancestor of Mitt Romney moved to a Mormon colony in Mexico in the 1800s; Mitt’s branch of the Romney family, including his father, moved back to the United States in 1912, 35 years before the current presidential candidate was born. — CBS Evening News, January 5. 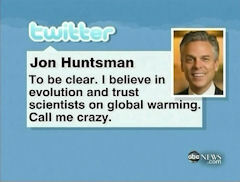 — ABC’s Jon Karl on World News after Huntsman dropped out, January 16. 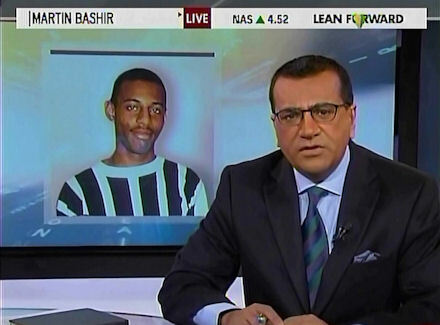 — MSNBC’s Martin Bashir on his eponymous January 6 show, talking about the murder of a black teenager in London nearly 20 years ago, a crime utterly unrelated to the Republican nomination race. — Diane Sawyer on ABC’s World News, January 17. — Former CNN and MSNBC host Bill Press talking about Newt Gingrich on MSNBC’s PoliticsNation, January 13. — Washington Post “Metro” section columnist John Kelly, January 12, noting the passing of a longtime local D.C. radio host Bill Trumbull, whose old time slot is currently filled by Sean Hannity and Mark Levin. “Perhaps” the Media Were “a Little Bit” Pro-Obama? 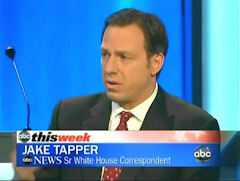 — ABC’s Jake Tapper on This Week, January 8. MSNBC In a Lather After Newt Tells Occupiers to Take a Bath; Are Republicans Dangerous or Just Stupid? Still Cheering "Occupy" Radicals, "From Every Walk of Life"